A coalition of student workers and American Federation of State, County and Municipal 3299 representatives sent nearly 30 delegates to the University of California Regents meeting in San Francisco to reiterate their previous demands and protest a variety of the UC system’s practices. Students from almost every UC campus were in attendance, seven of whom came from UC San Diego. Back in December, a statewide effort of student advocacy groups delivered letters of demands to all UC chancellors, requiring a response by Jan. 15. 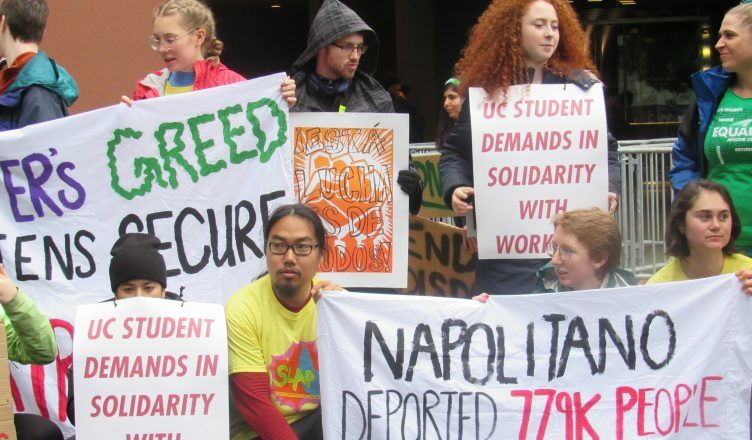 These demands included expanding livable wages and stable benefits to all UC workers, ending the practice of subcontracting labor, divesting from companies that they cite as having supported anti-Palestinian efforts, and ending compliance between campus police and federal immigration authorities. Prajay Lolabattu, a student intern with AFSCME 3299 at UCSD and member of the UCSD Labor Commission, told the UCSD Guardian that the action at the Regents meeting was a response to this inaction from the chancellors. In a Dec. 17 letter from Dwaine Duckett, vice president of Systemwide Human Resources, the UC administration contested a number of the student workers’ demands. “As a matter of course, [the University of California] pays its service workers wages that are equal to, or are higher than wages paid by other employers for similar work in the communities surrounding our campuses and medical centers,” the letter reads. The list of demands delivered to the UC chancellors cites this statement to critique the UC system for instances of ICE agents appearing on UC campuses. The list demands that the UC system enforce its own policy. In response to this demand, a letter dated Jan 11. was sent from Alexander Bustamante, the Senior Vice President of the UC’s Office of Ethics and Compliance. At the Regents meeting, the UC Student Labor Coalition listed their demands to a public comment panel of Regents, including UC President Janet Napolitano, during the time allotted for public comment at the Regent’s meeting. “They don’t actually want to hear what we have to say,” said protester Karter Lowell. Kathryn Lybarger, president of AFSCME 3299, addressed the crowd. Lolabattu also said that it was important for students to recognize how much of an impact the issues have for them. “We will be standing here one day, celebrating the victory that we’ve won,” Lybarger told the crowd. The chair of the task force examining policing policies in the UC system will hold two remaining town hall meetings with students and student leadership at UC Irvine and UC Santa Barbara to address questions and concerns. Did Chancellor Khosla respond to the letter? I will search for a separate story on that…. very interested to know (and if so, how he responded). If no one responds I will add, in more detail, instead of only focusing on those on campus. I would like to note off-campus “happenings” that affect Transfer students specifically; however, can be applied to students who start rooming on their own off-campus with added support in the Academic area when “things” go “array”.